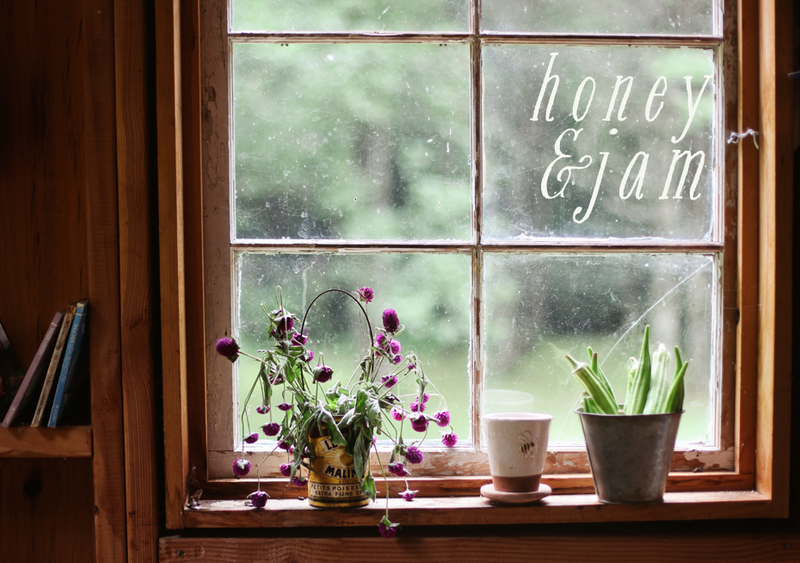 honey & jam | recipes + photos: Devil's Food Cupcakes with Raspberry Frosting. 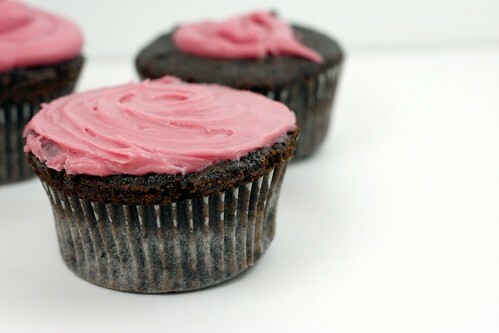 Devil's Food Cupcakes with Raspberry Frosting. Ohhh this one is a keeper. Sometimes I come upon a recipe, think it sounds alright, print it out and then forget about it. That’s what I did with this one. Today I made these, and I’m trying to come up with a word to describe them. Delicious doesn’t seem strong enough. My father, who hates chocolate, even liked these. They are so light and airy, and the chocolate flavor isn’t overwhelming, which I like, because like my dad, I’m not a huge chocolate fan. The frosting, while tasty, is super sweet, so I plan on using very small quantities next time. 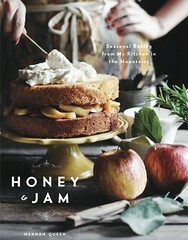 I found the recipe here, it originates from here. I tweaked it just a itty bitty bit. 2. Sift together cocoa powder, cake flour, salt, baking soda, and baking powder in a bowl. 4. Mix together the coffee and milk. Stir half of the dry ingredients into the butter mixture, the add the coffee and milk. Finally stir in the other half of the dry ingredients. 5. Pour into lined cupcake pans, about 3/4 of the way full, and bake for 25 minutes, or until a toothpick inserted into the center comes out clean. Cool completely before frosting. Place butter and jam in a mixing bowl or an electric mixer fitted with a paddle attachment and cream until well incorporated, about 2 mintues. These are fabulous! I can testify. I love the color of those cupcakes, they look delicious! chocolate and rasberries are a match made in heaven. I love how simple and pretty these look, they sound really yummy! i love pink frosting! especially if it has a great flavor like raspberry. My goodness, it so looks like a keeper. Love devils food and with raspberry, must be delicious!! They are soo pretty. These look great Hannah! I love the raspberry and chocolate combination, yummy! I just made these and they're fantastic! 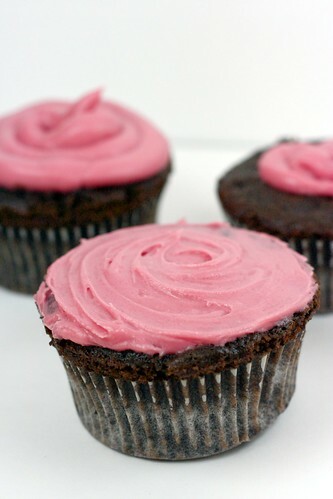 The sweetness of the raspberry frosting is the perfect compliment to the chocolate cupcake. (The cupcake itself came out really well--moist and rich and not too dense.) My office is getting treats tomorrow! Funny! I was going to make this Devils Food cake recipe anyway from David Lebovitz's post, and I have raspberries at home, so your frosting recipe will be just perfect for my Baking Class midterm! Great minds think alike. I'll be following your blog! I made these on Friday, and everyone loved them! I tinted my frosting using Wilton paste, and the color looks very much like yours. I also cut a hole in the cupcakes and dropped in some raspberry jam. I can't wait to try your vanilla cupcakes with strawberry frosting next. Thanks for a great recipe!! The raspberry frosting was the perfect filling for my dad's birthday cake. He couldn't stop raving about it - highly recommend it! What about the 1/3 cup of water? Just found your blog through a search for raspberry frosting, and I'm glad I did. We never use shortening, so I'm happy to have found an option that looks delicious and won't gross me out, haha. I love it! It tastes sooo good. I used strawberry jam, not raspberry, but it still tastes awesome. My friends like it. Thank you so much for sharing this recipe!